Just as olive oil is integral to Mediterranean cuisine, mustard oil is the essence of East Indian food. It is used extensively in Bengali cuisine, and aside from the oil, the seeds themselves are quite loved too, for use as whole spices, as well as for making mustard sauce. While the pungent flavour of mustard is most appreciated in this part of the country, it also enjoys a high level of popularity in the North. If you haven’t got a trained sense of taste and smell though, it will be pretty hard for you to tell what makes high-quality mustard oil different from the diluted, refined versions of it. Therefore, in this article, we will explain slightly easier methods you can use, to choose the best mustard oil for yourself, and we shall also give you a list of the top 6 best mustard oils available online in India. Mustard oil looks more or less the same if you judge it simply based on how it looks like in the bottle. There are a few things you could keep an eye out for though, to make sure the one you’re buying is better than all the others. Mustard oil remains one of the most popular oils in Indian cuisines, and the preferred method of extraction is still quite traditional, as the flavour achieved is much stronger. Kachi ghani refers to this traditional method of extracting oil using a wooden mortar and pestle, but unlike the olden days, instead of using cattle to work the pestle, it is now mechanically done. Low temperatures must be maintained during the process of extraction, in order to keep the nutritional properties of the oil intact. This technique of maintaining lower temperatures for oil extraction is known as cold-pressing in English. Although kachi ghani always uses the mortar and pestle way, that’s not necessarily the case for products that merely say they’re cold-pressed. Before we start talking about why the AGMARK is important, let us talk about what makes it different from the FSSAI certification: all edible products need the FSSAI certification to prove that they’re safe for consumption, while on the other hand, AGMARK is not something that products must get before they hit the market, rather it’s something that’s earned. 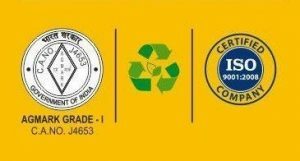 The AGMARK Grade 1 symbol is given to the best agricultural products to signify that they’ve met the requirements for the highest quality. In the case of mustard oil, this refers to the mustard seeds being free from pests, not containing low-quality seeds, not containing Argemone seeds, and only have seeds from Brassica Campestris Linn, Brasicca Juncea Linn, and Brasicca Napus. Pungency is not an attractive quality for many items, but when it comes to mustard oil, the more pungent its taste and smell is, the better it is. Mustard is supposed to have a strong flavour, so strong that it often irritates the nose and eyes, so if your mustard oil does not do that, then it’s probably not the real deal. Although this sounds like something you cannot check unless you’ve used the oil, there is a way for you to confirm whether the mustard oil you’re interested in, is actually of high quality. All you need to do is check the reviews, if there are lots of people who found the flavour to be pungent, then it’s most likely pure mustard oil. There are lots of mustard oils on the market, but we only want to focus on the best of the best, therefore, we shall introduce you to the top 6 mustard oils you can buy online in India. Those looking for organically sourced, cold-pressed mustard oil would love this product. It has a medium-strong aroma with a less pungent taste, which works absolutely perfectly for cooking most North Indian dishes, as they usually don’t need to have a strong mustard flavour. It doesn’t carry the AGMARK though, and it doesn’t mention whether it’s kachi ghani either, so we wouldn’t recommend it to those who prefer stronger flavours. Additionally, it is also one of the most expensive mustard oils on the market, so it’s not for those who want budget-friendly options. This is the one you should go for if you want to use mustard oil for making pickles. 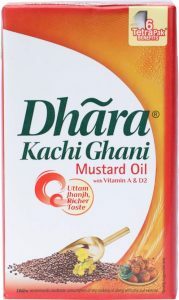 It’s kachi ghani mustard oil with a medium-strong smell and a slightly less pungent taste than usual, which is what makes it great for pickles, and it’s also quite affordable, so you can use larger quantities without worrying too much. The absence of the AGMARK, in addition to the lighter flavours, makes one wonder about the purity of the oil though. Therefore, we wouldn’t suggest it to those who are particular about the pungency of the oil. There have also been cases of leakage during delivery, so we’d advise you to choose a seller with high ratings to ensure it reaches you safely. If you’re someone who often cooks dishes that require extra strong mustard oil, then this is the oil of your dreams. It is made using the kachi ghani method of extraction, and the mortar is not made of just any wood, but rather from tamarind tree lumber, which is what makes the flavour of this oil much more pungent. 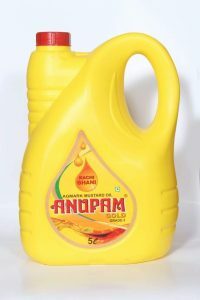 Since this is an AGMARK product, there are no doubts about its quality, but it also happens to be one of the most expensive mustard oils available. Therefore, if you’re not particular about the pungency, and are looking for a more economical option to use every day, we would suggest choosing one of the other products on this list. Those looking for a kachi ghani option for everyday use should go for this product. We recommend using for stir-frying in particular, as its strong taste and the pungent scent would be perfect for this purpose. In addition, since it doesn’t have a really high price tag, you could use it regularly, without burning a hole in your pocket. Although it doesn’t carry the AGMARK, its flavour has been compared to some of the best mustard oils in India. Aside from stir-frying, it could also be used for marinating, as its pungency helps cover any unwanted odours from meat and seafood, and adds a wonderful depth of flavour as well. 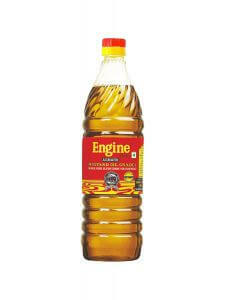 This is the product for those who consume mustard oil regularly and need something that won’t run out easily. It’s a kachi ghani product with the AGMARK certification, so it’s no surprise that it has one of the strongest scents and tastes. We would recommend for this for either a household with lots of members or for those who use mustard oil in various styles of cooking and preserving. Although it seems really expensive compared to the rest of the products on this list, if you consider the cost per litre, you’ll realise that it’s actually one of the cheapest mustard oils on the market. Which is why, we would suggest this to those who’re looking for a mustard oil to deep-fry things in, as both its flavour, and its price, are perfect for this. The best mustard oil on the market, this is an all-rounder product, so whether you’re just starting your journey, or you’re already a connoisseur, you won’t be disappointed with this. It is a kachi ghani product with the AGMARK certification, and its quality is unquestionable considering its strong, pungent aroma. Regardless of whether you’re deep-frying, stir-frying, marinating, pickling, or merely using it as a condiment, it will definitely make your dishes more delectable. Although it is slightly pricier compared to the others, it is properly packed to prevent any potential spills, and its rich flavours are definitely worth the cost. The most basic ingredients can often be the hardest to choose, and it is these seemingly unimportant things that make all the difference. Therefore, if you want to make sure your dishes are nothing less than a 100, then you need to pay attention to every single ingredient you use in it, even the most basic ones like mustard oil. 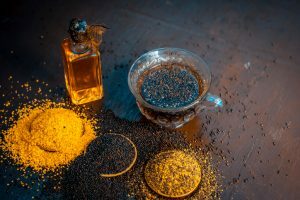 Since there isn’t as much information available on how you should go about choosing the best mustard oil, we hope our article was useful for you, and you were able to learn all the things you need to keep in mind to select the best quality one. We also hope our list of recommended products saved you some time and made it easier for you to decide which mustard oil you want to buy.